Summer is around the corner, and I don't know about you, but I love bringing out the lighter makeup when it gets hot. 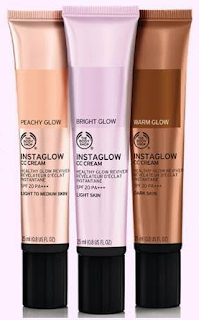 Thankfully The Body Shop have stepped in just in time to bring us a new release: the Instaglow CC Cream. The Instaglow CC Cream promises to provide light, filter-proof coverage, but it also contains a blend of ingredients (including Community Trade Aloe Vera and ginseng) to even out the skin tone, reduce shine, minimise pores and illuminate the skin. It also contains SPF20 PA+++ meaning that your skin will be protected from the sun and will help to prevent the future signs of ageing. The Body Shop promise that they will also moisturise the skin for 24 hours, so these babies sound like they're going to be some hard working multi-taskers for summer! They will be coming in a range of three different shades to suit different skin tones: Bright Glow for light skin, Peachy Glow for light-medium skin and Warm Glow for medium-dark skin. I for one can't wait to give this cream a go and thankfully we don't have to wait too long. The Body Shop Instaglow CC Creams will be hitting the shelves on the 17th May and will cost £14 each. You will also be able to find them at The Body Shop online. What are your thoughts on The Body Shop Instaglow CC Cream? Will you be trying them out?